curbing your fuel’s degradation is crucial. One of the easiest ways to maintain your mower for seasons to come is by using Briggs & Stratton’s Advanced Formula Fuel Preservative and Stabiliser. It’s the latest in fuel-treatment technology and includes powerful fuel additives to protect your fuel system. Fuel begins degrading almost as soon as you pump it. As it breaks down, gums and varnishes are formed that can stick intake valves and clog fuel lines and carburettor jets, resulting in severe starting problems. The Advanced Formula Fuel Preservative and Stabiliser fights the harmful effects of water separation. This fuel additive contains corrosion inhibitors that form a protective barrier on metal parts to prevent rust. Detergents help prevent gummy build-up on engine parts. A metal deactivator works to stop the aggressive chemical reactions caused by dissolved metal ions in the fuel. 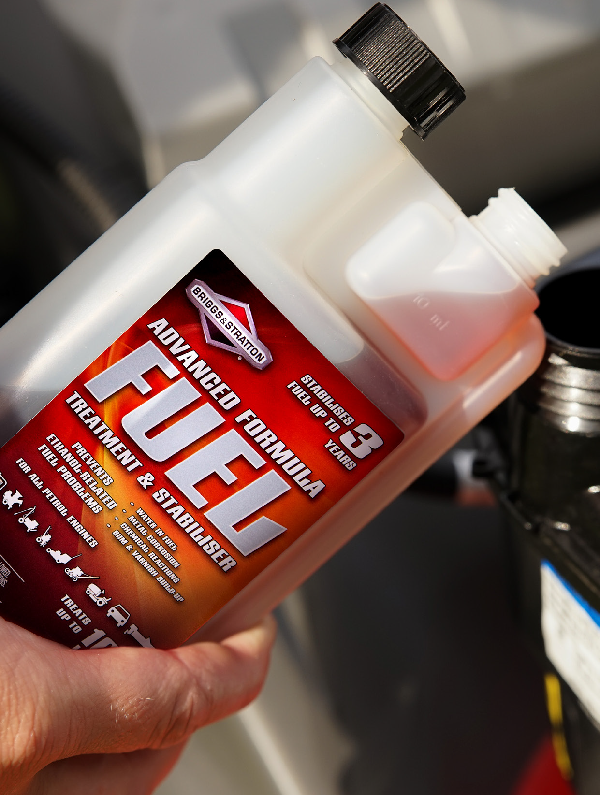 Briggs & Stratton Advanced Formula Fuel Preservative and Stabiliser also guards against octane loss due to ethanol separation, protecting your engine against pre-ignition and other low-octane events. Add the Briggs & Stratton Advanced Formula Fuel Preservative and Stabiliser according to package directions and then run the engine for a few minutes to circulate the solution through the carburettor. The super-concentrated formula is available in 250ml and 1-litre bottles, exclusively from your authorised Briggs & Stratton dealer as well as Bunnings Warehouse.